Italian midfielder Andrea Pirlo takes part in a training session Monday at Estadio das Dunas in Natal, Brazil. Tuesday’s World Cup matches will determine which teams advance from Groups C and D. Although Colombia and Costa Rica are locks for the Round of 16, and England is eliminated, it remains to be determined which side will come out on top of each group. Let’s take a look at the possibilities in Brazil. Group D will kick off first, with Costa Rica and England playing in Belo Horizonte. Italy and Uruguay will tangle in Natal. The scenarios in Group D are quite simple. If Italy draws or beats Uruguay, Italy will advance. If Uruguay wins, it will advance instead. 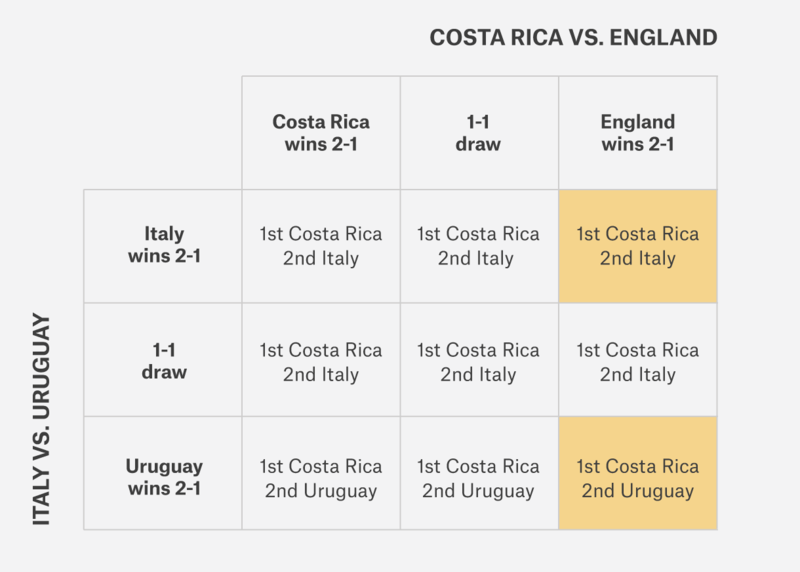 Costa Rica is certain to advance regardless of its result against England, whose slim chances of advancing after a loss to Uruguay last week have already gone to zero. Costa Rica will qualify as the first-place team unless it loses to England and the winner of the Uruguay-Italy match makes up the goal differential deficit. The chart above assumes that all wins come by a 2-1 score and all draws are 1-1. (These are some of the most common scores for wins and draws, respectively.) But I’ve highlighted, in yellow, the cases in which a different score could make a difference in the group standings. For example, a 2-0 Italy win and a 2-0 loss by Costa Rica against England would advance Italy in first place and Costa Rica in second. Still, Costa Rica has an 89.0 percent chance of finishing first. Colombia is all but certain to emerge as Group C’s winner. It has a 98.5 percent chance of doing so, according to the FiveThirtyEight forecast, and can guarantee its victory over the group by winning or drawing against Japan. A win or draw by Colombia would also make it easy to determine the second-place team from Group C: whichever side wins the match between Ivory Coast and Greece. 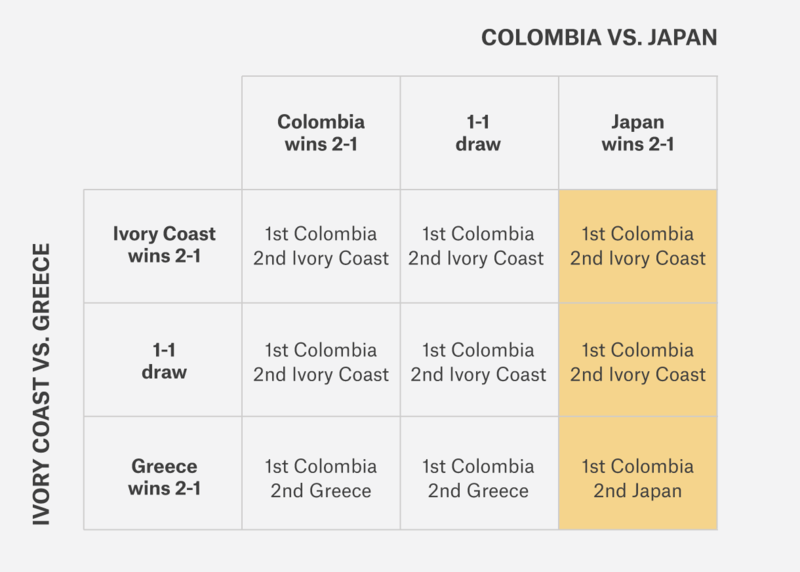 The more complicated cases come if Colombia loses to Japan. If Japan wins and Greece wins, too, for example, then Colombia would take first with six points while Japan and Greece would be tied for second with four points. (Ivory Coast would be out of the tournament.) Japan has a better goal differential than Greece, however, and so would be favored to make the knockout stage. A Japan win and a draw between Ivory Coast and Greece would produce a tie for second place between Japan and Ivory Coast. In that case, Ivory Coast would be favored to advance on the basis of its superior goal differential and head-to-head win over Japan. Colombia could be knocked into second place only if it loses and Ivory Coast wins, results that would give each team six points. But Colombia has the tiebreakers in its favor, so it would have to lose by a lot, and Ivory Coast would have to win by a good margin, for Los Cafeteros to end up No. 2.